An address in London’s East End connects the only existing photograph I have of my grandmothers sister Rosa Newman. Rosa died before I was born. 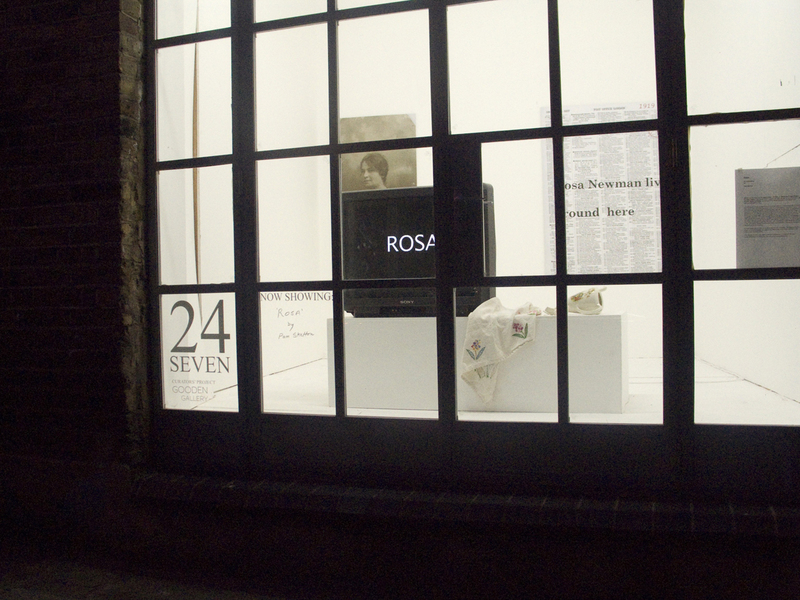 This artwork work re-connects the time when the photograph of Rosa was taken in the 1920’s, the shop where it was taken, and a video conversation between myself and Rosa which occurred at the time of making this work in 2011. The photograph is very old and the bottom half of the image has perished. The aged partially distressed paper testifies to the passage of time, whose texture, akin to film inscribes the qualities of the infinite on the finite, and as such is also akin to the family album with which it is also linked. The image in the photograph shows a woman still young, with a direct and confident gaze. She is wearing a low-necked dark coloured lace blouse. Her hair is wavy and tied back. The reverse side of the image has through time become indelibly bonded to its brown paper backing. Faint traces of handwriting and printed text seep through whilst on other parts of the surface fibrous and damaged areas suggest the aerial views of landscapes. The photograph was taken at ‘Capital & Counties Studios’, 144-146 Bethnal Green Road (the name and address of the studio are shown on the back of the photograph) at an unknown date and time. The photographic studio is long since gone. Today at 144 Bethnal Green Road is ‘Bangla Carpets and Furniture’ while at 146 is ‘Le Grenier’ a treasure trove of collectables of all kinds. As well as recording to camera sequences of the Bethnal Green Road area, I documented the interior of the Le Grenier (courtesy of the owner Jean-Louis) and with the 1919 Kelly’s Post Office Street Directory (courtesy of Tower Hamlets Local History and Archive Library) formed a new work played over monitors and two large digital prints.